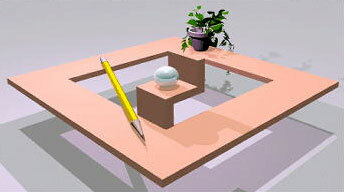 World Mysteries: Illusions and Brain Teasers. An optical illusion is any illusion that deceives the human visual system into perceiving something that is not present or incorrectly perceiving what is present. Discover the world of optical illusions where your eyes and your brain can fool you. 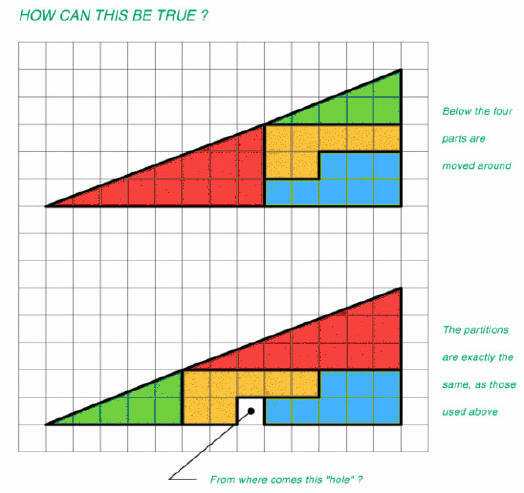 Here you will find some of the best illusions and brain teasers around (and related resources). Our visual system is designed to allow us functioning in three-dimensional environment which is filled with light, shading, color, texture, and full of objects of different sizes at different distances. Most of us take vision for granted without realizing how complex and difficult task our brain is performing in order to correctly represent the "real outside world". Our perception is created by our brain's interpretation of visual information and sometimes it results in fascinating visual illusions. Our mind gets "actively" involved in interpreting the perceptual input rather than passively recording the input. It does not always accurately represent that input. Ambiguity: more than one way of perceiving stimulus - Necker Cube, Duck-Rabbit. These are examples of physical illusions, where what we see is not really there, but where the cause of the illusion in the behavior of light before it reaches the eye. 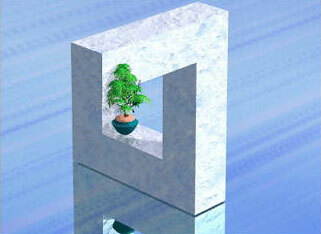 A mirage is a natural illusion that is an optical phenomenon. It is produced by the reflection of light when it passes into a layer of hot air lying close to a heated ground surface (known as a temperature inversion). 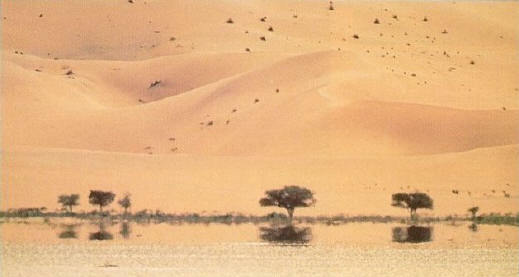 In deserts, mirage may create the illusion of a lake in the distance (which is actually an image of the sky reflected by the hot air (temperature inversion layer). The most commonly observed mirage is the inferior mirage, which is usually seen as a shiny patch on a hot surface that is the reflection of the sky. Summer sunlight may raise the temperature of an exposed surface as much as 80°C or more than the air not far above it. A strong temperature gradient is established just above the surface, and with it a relatively thin layer of reduced density. The air is normal except for a thin heated layer, so the rays are mostly straight lines, but strongly curved upwards in the heated layer. An object AB appears to the observer at O reflected at A'B', inverted and below the horizon, in front of the shining pool that is the reflection of the sky. 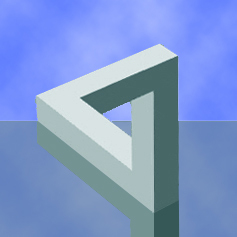 Except for inversion, the object is not distorted. Note that the rays to the top and bottom of the object are crossed. This crossing is necessary to produce the reflection. The object AB is also visible by direct rays in the normal way. It is not very unusual to see such inverted images, but in many cases there is nothing to be imaged, so just the shining pool of the sky is seen. 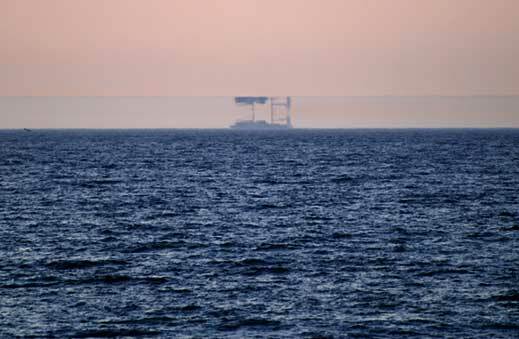 The inferior mirage with this geometry is frequently seen while driving in the summer, and cars ahead may be seen reflected in it. A superior mirage occurs when the air below the line of sight is colder than that above. This is called a temperature inversion, since it does not represent the normal equilibrium temperature gradient of the atmosphere. Since in this case the light rays are bent down, the image appears above the true object, hence the name superior. They are in general less common than inferior mirages, but when they do occur they tend to be more stable, as cold air has no tendency to move up and warm air no tendency to move down. the Semptember 5th, 2007 on the beach of Furadouro in Ovar, Portugal. Superior images can be straight up or upside down, depending on the distance of the true object and the temperature gradient. Often the image appears as a distorted mixture of up and down parts. 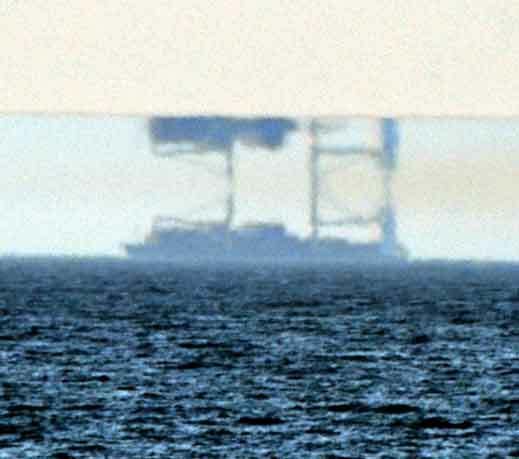 The fata morgana is a complex mirage in which distant objects are distorted as well as elongated vertically. For example, a relatively flat shoreline may appear to have tall cliffs, columns, and pedestals. The phenomenon occurs under much the same meteorological conditions as the superior mirage with inversion, and contains features of both towering and inversion. Antisolar rays are sometimes seen in the direction opposite the sun, converging to the antisolar point (towards the shadow of your head). They are caused by sunlight being scattered from aerosols like dust particles and water vapor. 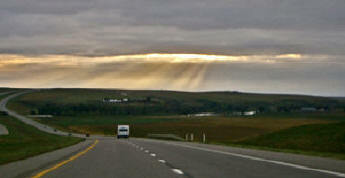 Clouds or terrain may block the sun in some places, which causes rays of light to become visible. The sun's rays are all parallel to each other, because the sun is very far away. However, perspective causes the rays seemingly to diverge from the sun's position, or, in the case of antisolar rays, converge to the point opposite the sun (antisolar point). The sun's rays are actually parallel. (just like road lines appear to converge in the distance). There is no definitive location for a rainbow. Its location is determined only by observer's position relative to the sun and rain. A rainbow is an apparently real object, but we can never reach it. The temperature (and pressure) gradient in the atmosphere causes bending of light rays. 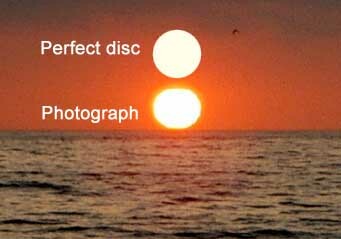 This is called atmospheric refraction. Light rays from the low sun or moon will refract more closer to the horizon. This is why the setting or rising sun (and moon) appears flattened: the light rays from the lower part of the sun's disk refract more than the rays emerging from the top, and the vertical angle over which you see the sun is decreased - it is flattened. Green flashes and green rays are rare optical phenomena that occur shortly after sunset or before sunrise, when a green spot is visible for a short period of time above the sun, or a green ray shoots up from the sunset point. It is usually observed from a low altitude where there is an unobstructed view of the horizon, such as on the ocean. 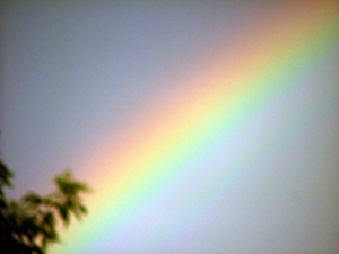 Its explanation lies in refraction of light (as in a prism) in the atmosphere and is enhanced by atmospheric layering. Whilst we would expect to see a blue light, the blue is dispersed (this is why the sky is blue) and only the green light remains visible. With slight magnification, a green rim on the top limb of the solar disk can be seen on most clear-day sunsets. However the flash or ray effects require a stronger layering of the atmosphere and a mirage which serves to magnify the green for a fraction of a second to a couple of seconds. --From Wikipedia, the free encyclopedia. This photograph was taken from Torrey Pines, California on Jan. 7, 1996. This is the kind of Green Flash associated with the mock mirage. 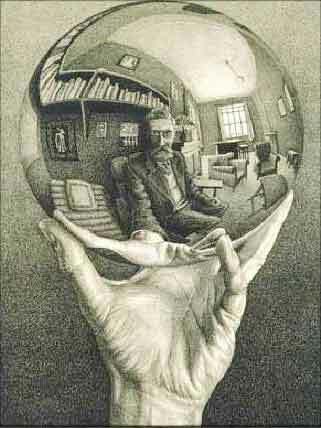 A mirror creates an “illusion” of another object or person being present. A light ray bends when it enters a different density medium at an oblique angle. The density of a material affects the speed of light ray traveling through it. 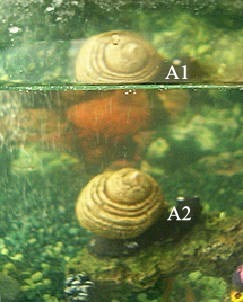 of the water and its size and angle different under the water. angle when viewed at the edge of an fish tank. 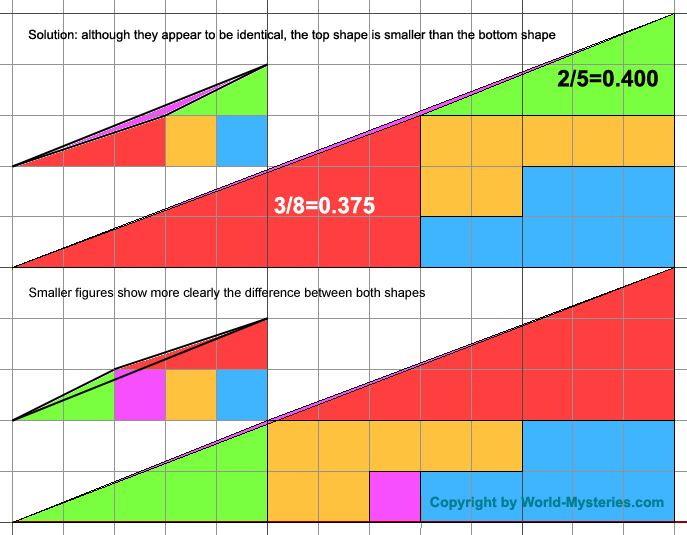 Both A1 and A2 are apparent positions of the object A. When light passes from one substance to another, it changes direction. 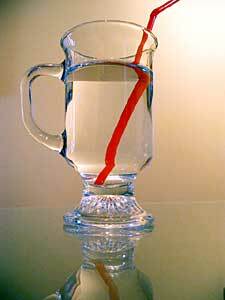 This effect is familiar to all of us from observations in bath tubs and swimming pools, and it is called refraction. The effect is usually dealt with as if light were rays that literally bend in direction as they pass through the boundary, but in fact the elegant explanation of what happens relies on the wave theory of light. Click on the image below for the solution of this puzzle. 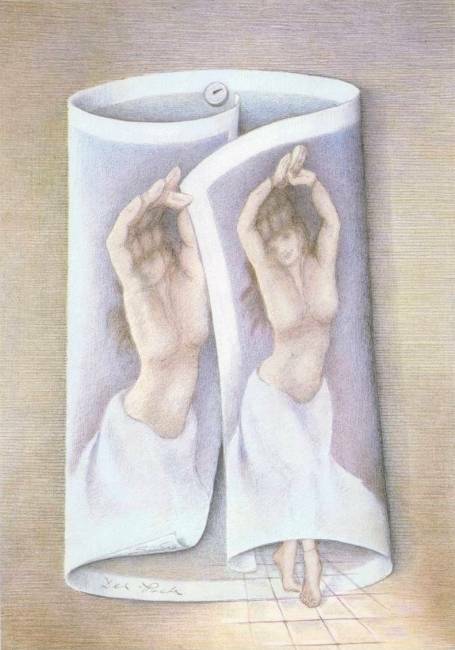 Optical Illusions: Can you believe your eyes? Contrast and Color effects, Illusion Artists.